What can next-generation journalists learn from Les Paul? A music icon of the 20th century passed away this week. 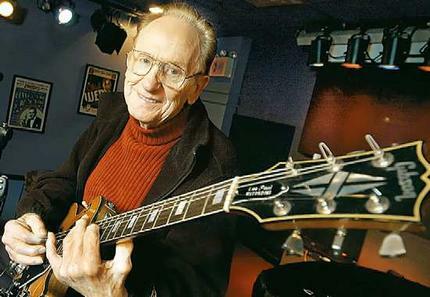 Aged 94, Les Paul was still playing weekly gigs in Manhattan right up to his death. Not just a talented musician, Les Paul was an innovator, and hearing him speak you realise he had within him the skills the journalists of the future will need if they’re to innovate as much as he did. Lesson: Les had a goal – a dream: something to aim for. It was as simple as making his guitar louder, but it set something on fire inside of him. Lesson: innovation takes a hell of a lot of work – and a lot of time. But keep working, shaping, building, refining until you get it right. Lesson: there’ll be lots and lots of knock backs – but never, ever give up. From guitarists to journalists to business people to web designers to sports stars: the same passion, dream, determination and perserverance runs through them all. I really do not usually remark concerning blogs and forums such as this but in this case and in keeping with the help of the remarks above I would take this opportunity to point out just how much I was pleased with your article. Undoubtedly enlightening in addition to well crafted – bless you for sharing this with all of us!